[Excerpt] This chapter examines the employment models founders use as they begin to construct new firms. The empirical setting is a sample of emerging technology firms in Silicon Valley. This chapter focuses on two questions: (1) Why are new firms founded under different conceptual models? and (2) What are the factors that lead a founding team to espouse a particular employment model? Burton, M. D. (2001). 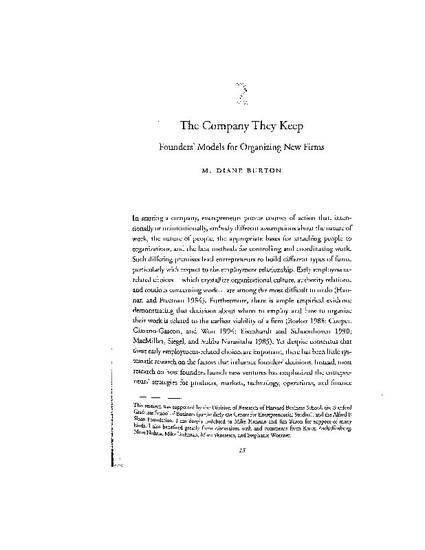 The company they keep: Founders' models for organizing new firms [Electronic version]. In C. B. Schoonhoven & E. Romanelli (Eds. ), The entrepreneurship dynamic (pp. 13-39). Stanford: Stanford University Press. ©2001 by the Board of Trustees of the Leland Stanford Jr. University. Reprinted with permission.